Food should be delicious, healthy and sustainably produced. Researchers are working on new methods to use as many parts of plants as possible for nutrition. In the future, vegetable ingredients could replace animal raw materials. Lupin seeds, for instance, can be used to produce low-fat, exquisite sausage products. In emerging countries such as China or Brazil, meat consumption is rising dramatically. Indeed, worldwide consumption of red meat has quadrupled since 1961. The United Nations Food and Agriculture Organization (FAO) expects increasing prosperity to lead to a doubling of global meat production by the year 2050. The question is whether our planet, with its limited farmland resources, will still be able to meet all of our needs into the future. Possible solutions for the brewing dilemma are familiar to Dr.-Ing. Peter Eisner of the Fraunhofer Institute for Process Engineering and Packaging IVV in Freising, Germany. It takes a lot of land to produce meat. "Producing a kilogram of meat consumes between seven and 16 kilograms of grain or soybeans as animal feed," Eisner reports. "As a result, in the US around 80 percent of grain is fed to livestock." Compared to meat production, the cultivation of plants as a food source is considerably less land-intensive. It takes 40 square meters to produce a kilogram of meat, yet that same space could produce 120 kilograms of carrots or 80 kilograms of apples instead. As the researcher points out: "Plants are a source of high-quality foodstuffs, but they can also provide raw materials for technological applications  and are a source of energy." He demonstrates this in the case of sunflower seeds: up until now, they were used for oil production, their residues serving as low-grade livestock feed. As a result, a 2 1/2 -acre parcel of land could be expected to yield around 950 euros. If all of the components were processed and converted to high-quality raw materials for the food, cosmetics and fuel industry, that same parcel would generate some 1770 euros in income. Plant-based food ingredients can be expected to play a particularly important role as a substitute for raw materials derived from animals. Eisner presented a "milk substitute" made from lupin proteins and suitable as a basis for foods such as ice cream or cheese. It contains no lactose, has a neutral flavor, is cholesterol-free and rich in polyunsaturated fatty acids. Lupin seeds are also the basic ingredient in a new vegetable protein isolate with fat-like properties that has been developed by IVV researcher Daniela Sussmann. 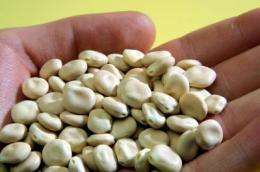 A special production method applied to the lupin seed yields a highly viscous protein suspension with a very creamy consistency. "The microscopic structure of this product resembles that of the fat particles in sausage meat. So you can use it to produce low-fat sausage products that taste just as good as the original," the researcher added. In sensory tests she investigated whether adding lupin protein could improve the juicy and creamy impression of a low-fat sausage recipe. With success: "By adding 10 percent protein isolate, we were able to markedly improve the fat-like impression of low-fat liverwurst." Since sausage products are among the foods with the highest levels of fat, this would certainly be a step in the right direction. On average, a German eats 31 kilograms of sausage products each year. The result: An overweight population and cardiovascular disease. If some of the fat could be replaced with proteins derived from plants, every one would benefit: the consumer by eating less fat, the farmer through higher in come, and the environment because plants can be produced more sustainably than meat. "Producing a kilogram of meat consumes between seven and 16 kilograms of grain or soybeans as animal feed" only if grain-fed. Stop doing that! Beef/dairy, chickens/eggs, and pork can all be raised without grain as feed. And low-fat often means high-carb, which is just as fattening. Certain fats are essential nutrients. This article doesn't sound like science to me. Exactly. The healthiest diet that is most resistant to weight gain is low-carb, high fat. This "fat is bad" mantra needs to die out. Obviously the food pyramid has failed. Stop eating grain and you'll stop being fat.